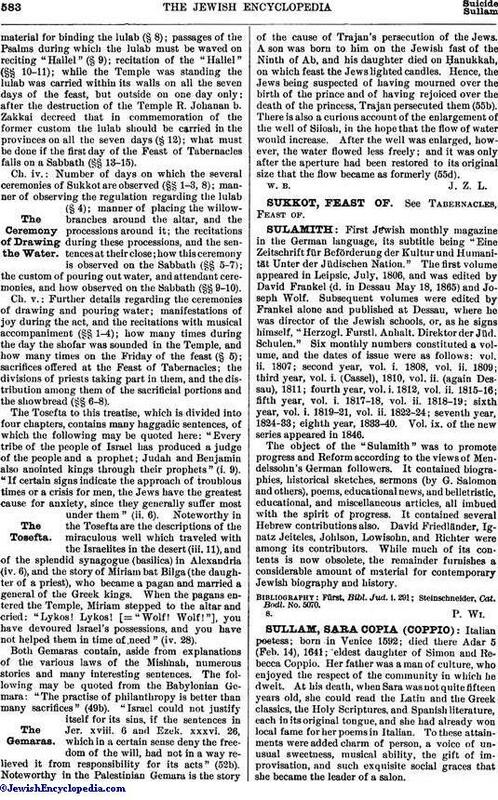 First Jewish monthly magazine in the German language, its subtitle being "Eine Zeitschrift für Beförderung der Kultur und Humanität Unter der Jüdischen Nation." The first volume appeared in Leipsic, July, 1806, and was edited by David Frankel (d. in Dessau May 18, 1865) and Joseph Wolf. Subsequent volumes were edited by Frankel alone and published at Dessau, where he was director of the Jewish schools, or, as he signs himself, "Herzogl. Furstl. Anhalt. Direktor der Jüd. Schulen." Six monthly numbers constituted a volume, and the dates of issue were as follows: vol. ii. 1807; second year, vol. i. 1808, vol. ii. 1809; third year, vol. i. (Cassel), 1810, vol. ii. (again Dessau), 1811; fourth year, vol. i. 1812, vol. ii. 1815-16; fifth year, vol. i. 1817-18, vol. ii. 1818-19; sixth year, vol. i. 1819-21, vol. ii. 1822-24; seventh year, 1824-33; eighth year, 1833-40. Vol. ix. of the new series appeared in 1846. The object of the "Sulamith" was to promote progress and Reform according to the views of Mendelssohn's German followers. It contained biographies, historical sketches, sermons (by G. Salomon and others), poems, educational news, and belletristic, educational, and miscellaneous articles, all imbued with the spirit of progress. It contained several Hebrew contributions also. David Friedländer, Ignatz Jeiteles, Johlson, Lowisohn, and Richter were among its contributors. While much of its contents is now obsolete, the remainder furnishes a considerable amount of material for contemporary Jewish biography and history. Steinschneider, Cat. Bodl. No. 5070.